...we've been having for the past few days. Who wouldn't love 75-80 degrees during the day, and 40-50 at night. You don't have to run the furnace or air conditioner. Perfect. Yesterday I went to a couple of craft shows and had lunch with a friend. After lunch I came home and sat out on our deck for the afternoon and read my book. Yes, I had things that needed to be done inside the house, but they waited for me. Today I had a date with my husband to play golf. 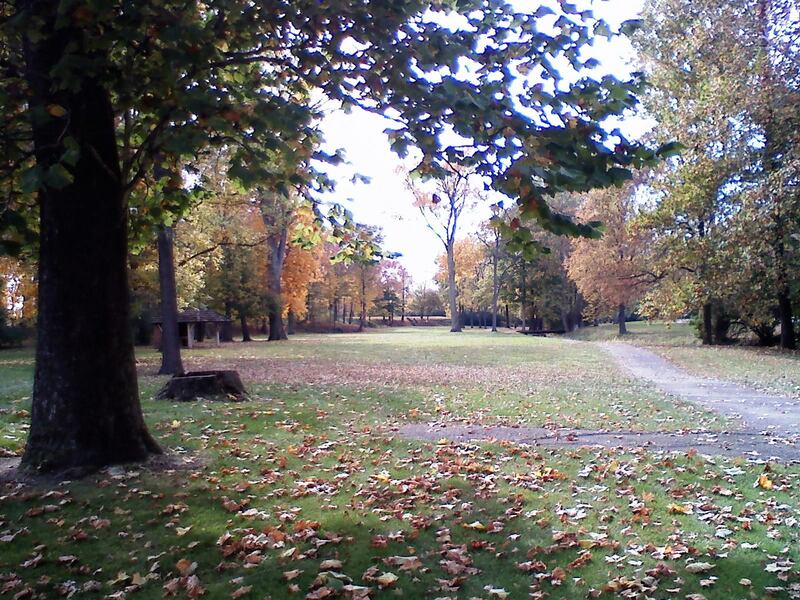 We had purchased a Groupon recently for 2 Rounds of Golf at the Honeywell Golf Course in Wabash, Indiana. So, after church today we headed west to Wabash. We couldn't have ask for a day any more perfect for golf than today. We had a wonderful day. The ride there and back was filled with the lovely autumn colors on the trees. This is a picture of the 14th fairway. We looked and looked for my ball for quite awhile. It didn't go into a hazard or out-of-bounds. 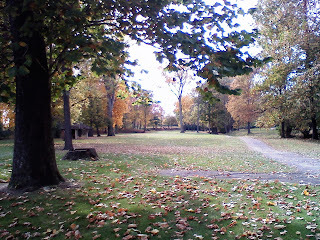 It was in the fairway among the fallen leaves. The weather forecast for the next few days looks much like today. I will try to spend as much time as I can outside.